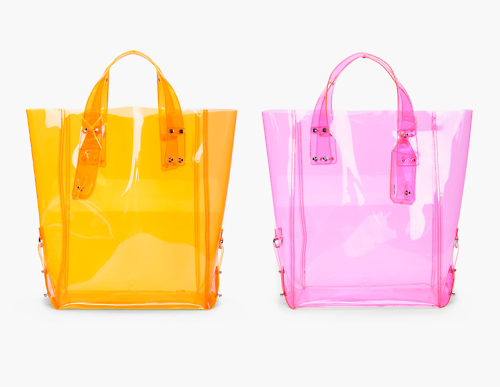 Just got some time to browse the net for good finds and found these oh so cute MCQ ALEXANDER MCQUEEN Kingsland Vinyl Shopping Totes in orange and pink colors. It's transparent with seilver tone hardware. Approx. 11.5'' length, 4.5'' width, 15.5'' depth. 100% plastic. Can be bought at hefty $210.00 each. I want one but that is way too expensive yay!